UPDATE: In November 2014, we sold 100% of Flight Display Systems to a private equity group. Thanks to this sale, I never have to worry about the cost of adding guacamole to my burritos ever again. Me and my father, the founder of Flight Display Systems, at one of our trade show booths. Photo taken 25 September 2007. My father started Flight Display Systems in the basement of our home in 1999. He worked on it part-time for a few years. In 2001, he quit his job (or was fired?) and started to do it full-time. My mother joined soon afterwards. My mother, Susan Gray, in the office area. I think this was her desk? It’s more organized than my father’s desk for sure. Their first employee was Angel Rodriguez, an avionics technician. I joined the company in a full-time capacity in 2005. I thought I was just going to help them out for a few weeks. Then a few weeks turning into a few months, and a few months turned into almost a decade and all of my 20s. Getting the chance to work closely with my parents and helping them grow their company was the best thing to ever happen to me. The company manufactured aircraft electronic equipment. Flight Display Systems designs and manufactures electronic components for in-flight entertainment (IFE), cabin management (CMS), and military / special mission. The company manufactures over 160 unique in-flight products targeted at the new, retrofit, and refurbishment market. These products include the Wireless JetJukebox File Server and Media Streamer, the Flight Display System World Wide Moving Map, a comprehensive offering of high-definition LCD monitors in sizes ranging from 5 to 55 inches, Blu-ray and DVD players, custom cabin management systems, and a line of iPod, iPad, and iPhone accessories. Our Form-Fit-Function-Plus (F3P) department builds custom, “ruggedizing,” components for use in military and special missions applications. The basement of our suburban home was converted to a sales room, production line, and inventory warehouse. These are a few panorama photographs that I made, likely in 2003. My father used the spare bedroom in our basement as his first office for Flight Display Systems. The kids play area of our basement, formerly home to my after-school hangouts, turned into a production and assembly area. Component and shipping inventory in an unfinished room in our basement that used to feature a miniature pool table. In 2004, Flight Display Systems moved into its first office in Alpharetta, Georgia. We occupied a small side room of the master tenant who was an electronics testing business. Everyone worked together in an “open floor plan” mixed with warehouse space. Eventually we bought the entire building and expanded into another section. Me carrying boxes of USB thumb drives to stack on the warehouse shelves. Photo taken 11 April 2005. My desk at the first real “office” for Flight Display Systems, on Francis Circle in Alpharetta, Georgia. Photo taken 10 Sept 2004. Note the plethora of Race Trac cups which were likely filled with diet soda. This is where the company grew the most. We moved here in 2005, initially occupying just the right half. Before we moved in, the office was home to a t-shirt printing company. The floors were covered in paint and grime from the messy printing process. Overhead view of the office. At first, we only occupied the right-most half of the building. It took several years before we got the other half. June 2008 photo of the Grassland building, with a big Flight Display Systems sign and painted awnings. Me in the office, when I used to have long hair. Photo taken 3 January 2006. My friend Danielle Strle visited our office in 2007. We had a company party that day and I put her to work answering the phones! She’s sitting at our Accountant or Purchasing Officer’s desk here. Photo taken 27 April 2007. Early employees (and one intern!) at the Grassland office. That’s Angel, on the right. Photo by my mother! Angie and Lisa, two technicians at Flight Display Systems. They helped with soldering and technical assembly. Photo taken 28 November 2005. We took this picture on my birthday, 8 December 2005. Everyone in the company except for Gwen and Jay gathered in the conference room. I loved helping with our trade shows. It was thrilling every year. This is the earliest image that I have of me helping out my father: 19 May 2001, at a regional air show in Georgia. Note the CRT monitor! NBAA 2005. Left to right – Tom Austin, David Gray, Jay Healey, me, and Angel Rodriguez. Not pictured: Susan Gray, JJ Manton. Back at the office: Pat, Lisa, Gwen, Jeffrey, Lucas, and Osvaldo. Photo taken 17 November 2005. 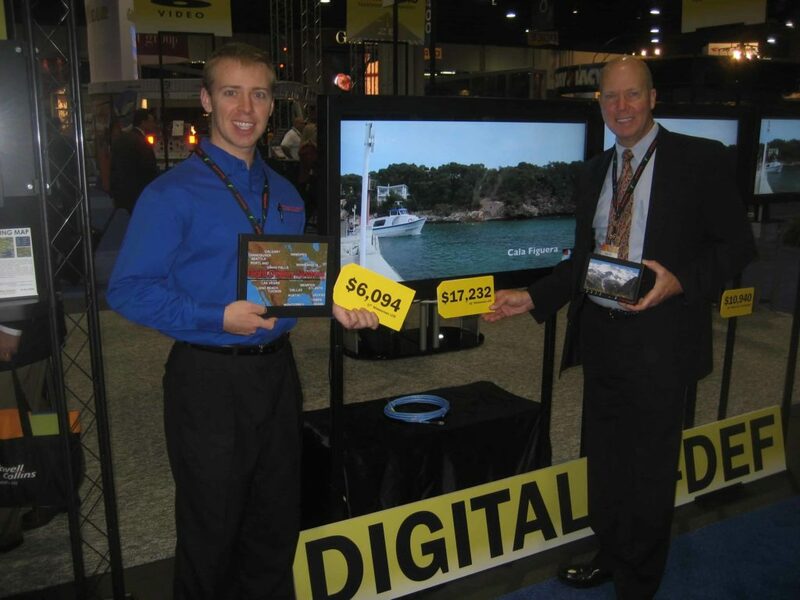 Our booth at the NBAA 2006 trade show looked nothing like any other company’s. I remember us thinking, “It’s way too busy.” But this turned out to be our best trade show ever. It kept getting better. NBAA 2008. We had a bigger team! Everyone who attended except for Jay Healey is shown here. Photo taken 7 October 2008. Our phone number for many years at 678-867-6717. Because of the large number of sevens, this was a funny number to say to people when we would do outbound calls and had to leave a message. (Marketwired – November 11, 2014) – Harbert Private Equity Fund III, L.P. (“HPEF III”) announced that on November 5th, it acquired 100% of the assets of Flight Display Systems and its affiliated entities (collectively “FDS”) while also appointing Mr. Reed Macdonald, a prior executive of the company, its Chief Executive Officer. HPEF III’s acquisition vehicle was FDS Avionics Corp. d/b/a Flight Display Systems. Headquartered in Alpharetta, Georgia, FDS is a leading designer, developer, and light manufacturer of cabin electronics for business and commercial aircraft, including cabin management systems and in-flight entertainment solutions, and ruggedized special mission military monitors and other retrofit solutions requiring adherence to military specifications. Mr. Macdonald, who had previously served as the company’s Chief Operating Officer, steps into the leadership role of the company possessing extensive knowledge of FDS’s markets, clients, and robust product capabilities. HPEF III is the most recent private equity fund sponsored by Harbert Management Corporation, which seeks to invest in market leading companies that possess scalable infrastructure and defensible competitive advantages. Additional capitalization for the transaction was provided by Cadence Bank and Fidus Investment Corporation. Advisors to HPEF III included Smith, Gambrell & Russell (legal), Habif, Arogeti & Wynne (accounting), and Renaissance Strategic Advisors (market). VRA Partners, LLC served as financial advisor to FDS while Wyatt Tarrant & Combs LLP provided legal counsel. There’s a lot that I left out. Including the blood, sweat, and tears from dozens (hundreds?) of people not pictured. I hope to update this page soon with more photos and stories. Do you have any pictures or anecdotes from the early days of Flight Display Systems? Please email me!